July?! Seriously? The apprentices fired up the woodstove Friday afternoon, after coming in from a soaking in the fields. Many plants, similarly chilled, are holding back on growing until someone convinces them that it’s actually summer. But other plants continue to trek along, regardless. Like the garlic!! 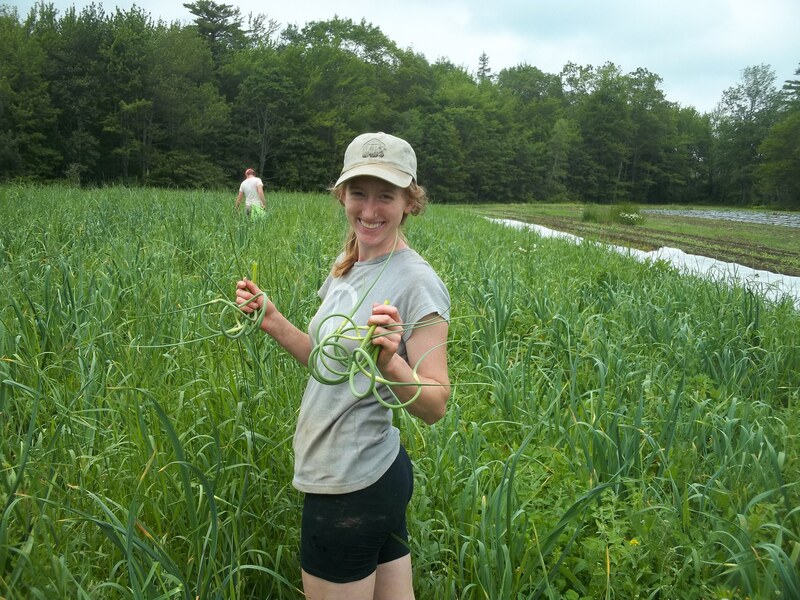 My absolute favorite seasonal treat was harvested this week: Garlic Scapes. Scapes are the gorgeous swirl of a flower spike that is sent up by the garlic plant. We break them off so that the plant will put more energy into the bulb and less energy into the flower (thus resulting in a larger bulb), but also so that we can enjoy their amazing flavor. This is the point in the year we toss into the compost the remains of the 2012 garlic harvest and start chopping up scapes to use in any recipe that calls for garlic. In addition, we cook up daily our favorite side dish ever: sautéed garlic scapes. The recipes is included below, and it is simply delicious. When cooked like this CJ calls them “the wrinkly green sticks” and munches them up like French fries. Even though it’s Fourth of July week, our schedule at the farm remains the same. But if you’re not able to pick up your share at your regular time, we’ll hold it for you in our walk-in fridge at the farm so you can pick it up later. Or make other arrangements with us — just be in touch. Other news on the farm: no more duck losses since last week’s newsletter. We know that our woods house fishers, bobcats, and coyotes, and it may have been any one of them. Part of the risk of farming where we farm (as well as being the joy, when we get to spot them in a non-predatory moment). Have a wonderful week, and feel free to contact me with any questions or concerns. We’re keeping our finger crossed for summer squash next week! Have a great week, with wonderful meals.